I have once again been truly fortunate as I begin my in-depth research of my Goldschmidt line. Not only do I have the benefit of the research done by Roger Cibella and David Baron, but through Roger and David, I have now connected with another Goldschmidt cousin, Art Mansbach, my third cousin, once removed. And Art, the great-great-grandson of Seligmann Goldschmidt and Hincka Alexander, has a treasure trove of pictures and documents and other items related to the Goldschmidt family. Art discovered a box of photographs in his father’s attic, and fortunately most of them were labeled with the names of those depicted. From Roger, David, and Art, I now have a fair amount of information about our mutual ancestors, Seligmann Goldschmidt and Hincka Alexander, as well as pictures of them. 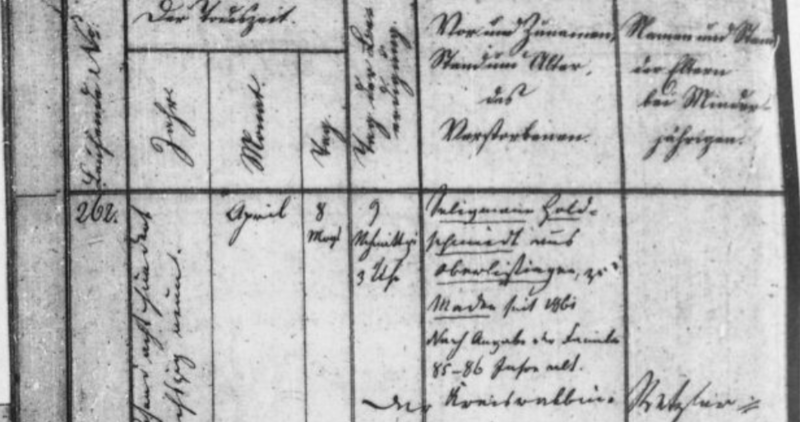 My three-times great-grandfather Seligmann Goldschmidt was born in about 1783-1784 in Oberlistingen, Germany. (His birth date is inferred from his death record, to be discussed below.) 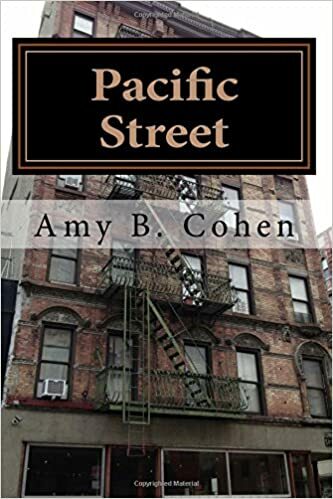 He was the oldest son of my four-times great-grandparents Jacob Falcke Goldschmidt and Eva Reuben Seligmann, though he had two older half-brothers from his father’s prior marriages. Although I have not found a marriage record, I assume that Seligmann married my three-times great-grandmother Hincka Alexander sometime before December 1, 1818, when their first child was born. According to her death record and gravestone, Hincka was born in Wolfhagen on September 14, 1797. I don’t yet know the names of her parents or whether she had any siblings. Seligmann and Hincka had their first child, a daughter named Sarah, on December 1, 1818, according to her death record. 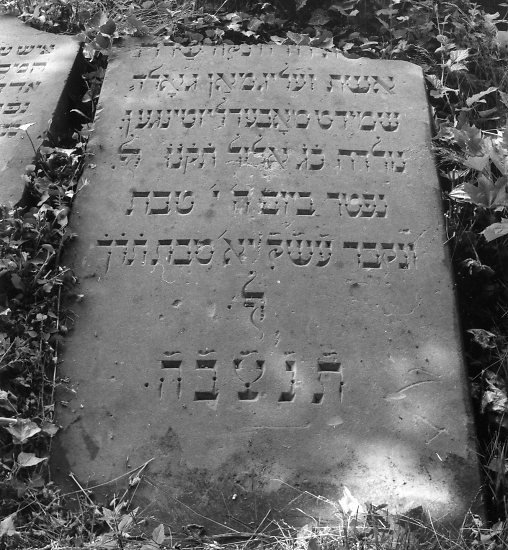 Sarah was followed by seven other children: Jacob (1822), Levi (1824), my great-great-grandmother Eva (1827), Beile or Bette (1829 or 1830), Abraham (1832), Meyer (1834), and Rosa (1837). All but Beile/Bette would end up immigrating to the United States, starting with Jacob who arrived before 1850 and ending with Sarah, who arrived in 1882. Thus, I will be able to report a fair amount about each of their lives and their families and will be devoting separate posts (probably multiple) to each one of them. UPDATE: Thank you to Lara Diamond for pointing out that Hincka’s name is partially legible at the very top of the stone—it says Hincka Sara! But for some reason her father’s name was not included. Thank you, Lara! 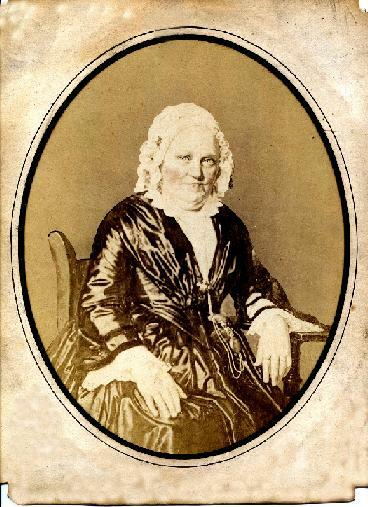 Wife of Seligman Goldschmidt from Oberlistingen. Her soul is bound in the bond of life. a sincere man among the generous ones. He walked the path of the good. He distributed his bread among the hungry. He was God-fearing throughout his life. 629 after the small count. His soul is bound in the bond of life. One interesting insight here is that Seligmann’s Hebrew name was Aaron. I love how this inscription revealed a bit about Seligmann’s personality and how he was perceived by his family; I wish the same had been done for Hincka. 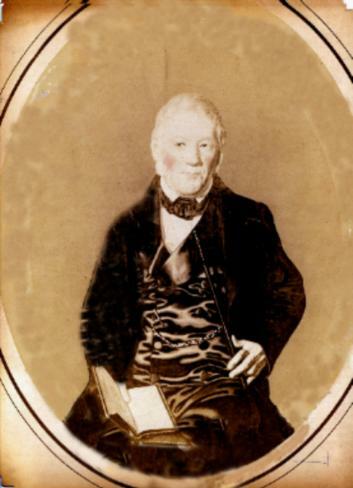 When Seligmann died in 1869, almost all of his children were in the United States, as had been many of them when their mother Hincka died in 1860. I wonder if they came home to Oberlistingen to bury their parents and whether they helped to determine the language that would go on their parents’ gravestones. Why was their mother’s inscription limited to the bare facts whereas their father’s was more descriptive and loving? In posts to follow, I will explore the lives and families of each of the children of Seligmann and Hincka. Several people raised questions about the meaning of “schutzbrief” in my prior post. I am researching those questions and will report back soon. 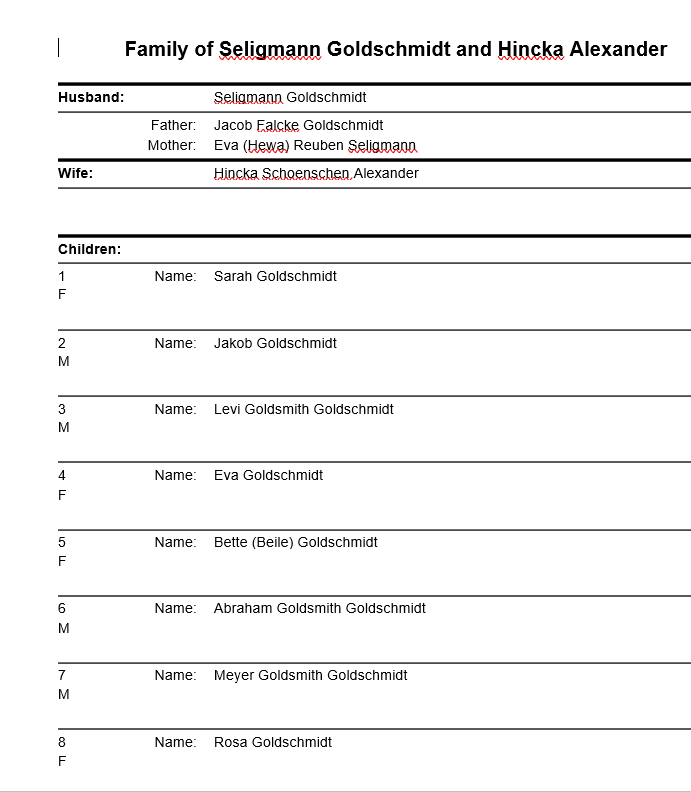 This entry was posted in Genealogy, Germany, Goldschmidt/Goldsmith, Oberlistingen and tagged Alexander, Germany, Goldschmidt, Oberlistingen by Amy. Bookmark the permalink. Truly a masterpiece in exposition of one of your important family lines! It is definitely a model to follow for all genealogists in the blogging world. After I am done with the Klopp story, I will have to return to the children (16) of my grandparents Friedrich and Emma Klopp. Thank you, Peter, for your kind words! I can relate to the trepidation you must feel about starting the story of those sixteen children. Whenever I see a large family like that, I have to take a deep breath and sigh—first, imagining giving birth to so many children and then anticipating the research and writing I’ll have to do to tell their stories! You are so right, Amy. There is a lot of work left to do. The ones that are left to do had a turbulent life and I have a wealth of information on my uncles and aunts. The 16th and last child by the way is my father, who died in 1964. It must have been something to be the youngest of sixteen! I look forward to reading your stories about him and all his siblings. I can imagine you will have a lot to report on each of the children who came to America considering the time period. Did Art discover the photographs in his attic before or after you made the connection to him? Yes, I imagine that the Goldschmidts will take up much of 2018 just as the Katzensteins occupied me for all of 2017! As for the photographs, Art found them many years ago. Some were posted on Roger and David’s old website years ago, and I asked David where he had found them. He then connected me with Art. I thought maybe your blog has increased interest in the families and people are looking here and there to see if they have photographs etc. It’s great that the old website is helping with the connections. Well, I hope that it is. But in this case I was lucky to find the old website years ago, long before I even started my own research. In fact, Roger and David were probably the ones who first tickled that interest. It’s all their fault! Great photos. So fortunate someone labeled them! Yes, another reminder that I really need to go back and label mine…. Wow! An amazing treasure trove to further enhance your heritage. Fantastic!!!! Thank you, Lois! I know—so exciting!! Wowsa, what a windfall! Such an amazing heirloom, and the labeled photos! Look at Seligmann’s outfit! He must have been very wealthy. That was surprising to me about him being a war hero because it almost sounds as if he would have been an officer to warrant such a beautiful gift. Any word on in what capacity he served? It’s a shame about her headstone, but another windfall with his headstone. Absolutely wonderful! I will ask Art what else he knows. All that information came from him. Thanks, Luanne! The whole story of the snuff box is so unique! and then to still have it! That snuffbox is amazing, as is that story behind it. What luck to encounter relatives with artifacts to help you along the way, and bless the people who label their photos. I wonder what is meant by “the small count” on Seligmann’s gravestone. Do you know? Does it pertain to the way Gentiles indicate the year? My brother asked me that also. 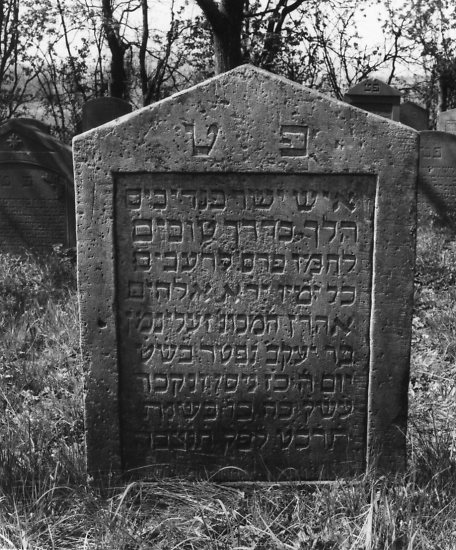 As I understand it, it refers to the fact that the first numeral of the year (5—- on the Hebrew calendar) is omitted from the gravestone inscription and assumed so only the last three digits are included. So the small count meaning without the 5000 reference. And yes, I feel VERY fortunate to have found Art and David and Roger!! What an amazing treasure trove of photo’s, and labeled too. The gravestones are so well preserved. Calling in the states for stones less than 100 years I often hear the weather has eroded them. I was wondering are these actually photo graphs Amy? or paintings of Hincka and Seligmann? Either way absolutely amazing to have them. Wonderful post…excited for the next post. Thanks, Sharon. From what I understand, they are photos, not paintings. My guess is that they were tinted as many black and white photos were back then. As for the stones, I agree—they are in good shape. I certainly saw lots of eroded stones in Germany, but also many that were in remarkably good condition. It’s just amazing there were photo’s of them. Such precious photos too! Wow! Art is so lucky to have in his possession these early photo’s of Hincka and Seligmann, along with the snuff box curio. It’s a lesson in the importance of labeling for our future generations. Yes, but how many of us are doing it? We take so many more photos these days—especially since the advent of smart phones. But do we label them? I admit that I am not on top of that task…. How wonderful that those very early photos have survived in excellent condition. I’ll be following the stories of their children. As always, you’ve done a wonderful job sharing theirs. Found photos in an attic that were LABELED??? Swoon. What marvelous pictures of Seligmann and Hincka! I am so happy that you were able to connect with the cousin who shared them with you. I love those genealogy miracles. I am also very curious about the information on the headstones’ origin. I can’t imagine an easy way for the children to accomplish that from America at the time. Do you know yet of any other living family members who were close by? Siblings, nieces/nephews, etc? Oh, there were many close family members still in Germany when they died, including two of Seligmann’s brothers and two of their daughters. But I have no way to know who was responsible for the inscriptions. Thanks, Amberly!